We have a very clear bespoke philosophy, explained here which fully outlines our commitment to you when planning your trip to experience the outstanding and varied delights of France and Belgium. Compromise, the thing that we all do, sharing each other's hobbies, mostly but not always through a shared interest, going shopping when we would rather be playing golf, visiting battlefields when we would rather be drinking champagne or visiting the personalised perfume shops of Paris, we all do it to some extent or another and if you don't you're either very lucky or single. Well, we think we have the answer, The Compromise Tour, you can experience as many or as few of your activities during the day but always be together over a beautiful dinner to share your day's experiences. 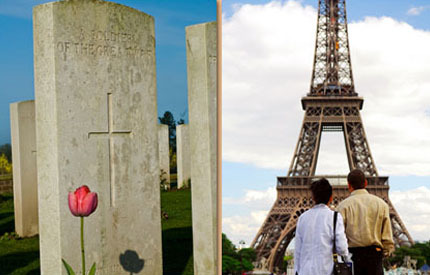 The options are limitless with you both having a personal tour guide to ensure you gain the most from your break, World War 1 battlefields, Paris, Theme parks, touring the Champagne region, Golf, horse racing, mountain biking, Bruges are just a few of the options that are available to you. Remember, this is your Compromise tour, so why don't you tell us what you want to do and we will create with you your perfect break. This tour was for three couples, the men wanted to play golf, watch football and visit the battlefields, the ladies wanted to relax with a bit of shopping thrown in. The couples arrived at Freeman farm on Thursday evening in time for dinner. Everyone had breakfast together before heading off, the men, to play golf and the ladies, sightseeing and shopping. The Men - Off to Le Touquet golf club for 27 holes on the 6,900 yard La Mer course, which has hosted, the French open and amateur championships. 9 holes in the morning followed by lunch and a battle over 18 holes in the afternoon. The Ladies - Travelled to Lille for the day, architecture was the objective of the morning with a tour of the array of architectural styles and points of interest throughout the city. The afternoon also had an architectural influence, although it was restricted to the architecture of the restaurants and shops. Everyone returned to Freeman Farm for dinner. Golf and football was the order of the day for the men, with the ladies touring the champagne houses of Epernay. The Men - First stop of the day was 18 holes of golf at the beautiful golf d'Arras club; this course has for many years' hosted major international competitions. The men played 18 holes before taking a light lunch, from the golf club we moved to the preserved trenches, tunnels and memorial at Vimy Ridge to cover the actions of April 1917. After dinner in a local restaurant we moved to the final destination of the day, Lens for a French league 1 football match. The Ladies - Headed to Epernay for a day visiting the Champagne houses of the region. Six venues were on the schedule, included was a master class in tasting and appreciation, lunch and time spent in the beautiful Champagne countryside. The ladies finished their day with dinner at a restaurant in Reims before returning to Freeman Farm. Sunday was a day of two halves, after a leisurely breakfast everyone embarked on a tour of some of the key sites of the Great War, followed by lunch at the Old Blighty Tea Room in La Boissellle. In the afternoon the men continued with their battlefield tour, the ladies visited Amiens with its beautiful cathedral for a relaxed afternoon of window shopping and culture. In the evening all three couples visited a local restaurant for dinner. 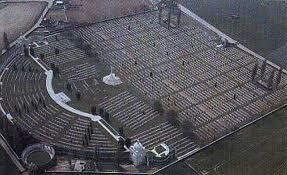 Tyne Cot Cemetery is the largest for commonwealth war graves in the world, it has over 11,800 graves and the memorial to the missing contains the names of over 33,000 soldiers of the commonwealth plus a further 1,176 New Zealanders.